Sweet and spicy, serve as your Christmas roast with all the vegetable trimmings or cold as a buffet centrepiece. Soak the gammon in cold water overnight. Drain and weigh to calculate cooking time, allowing 15 minutes per 500g. Put in a large saucepan with half the shallots and the cloves. (A preserving pan is ideal if your largest saucepan isn’t big enough.) Cover with cold water and bring to a simmer. 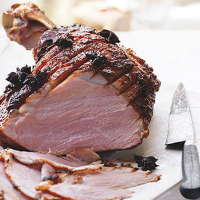 Cook gently for the calculated time, then turn off the heat and leave the gammon in the cooking liquor for 30 minutes. Preheat the oven to 180°C, gas mark 4. Lift the gammon onto a board and, using a sharp knife, cut off the skin, leaving a layer of fat. Using the tip of the knife, score lines, 3cm apart over the fat, then across in the opposite direction. Pile the remaining shallots in the centre of a roasting tin. Place the meat on top, scored side up. Crush half the jar of star anise, the coriander seeds and the chillies, using a small food processor, until fairly fine. (This can also be done using a pestle and mortar.) Press the spices over the surface of the meat, place in the oven and cook for 10 minutes. Mix together the honey and hoisin sauce then drizzle over the gammon, using a spoon. Press the remaining star anise onto the surface and return to the oven for a further 1 hour. Baste occasionally with the juices in the tin and cover with foil towards the end of cooking if the surface starts to over brown. Transfer to a serving plate, cover and leave to rest for 20 minutes before carving. Sweet and spicy, this part-boned joint is easy to carve and impressive enough to serve as your Christmas roast with all the vegetable trimmings. It’s also good served cold as a buffet centrepiece or alongside the roast turkey.